These people are much better than I am at restorations and creating videos, but they have inspired me to be a part of this subculture that tries to keep old electronics working for people to appreciate. That being said, I have utterly failed to retrobright or restore the Canon P101-D that I recently purchased at Goodwill for $10. When I first laid my eyes on it, I was thrilled to see a device with such a bold orange color. 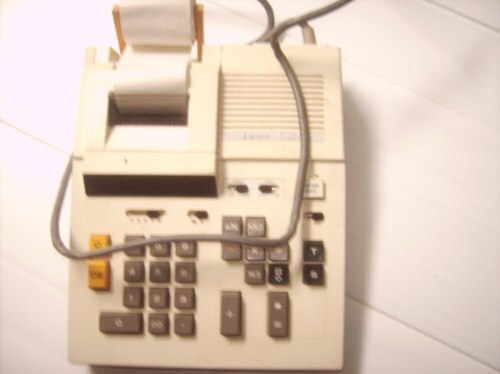 This was the kind of desktop calculator that would turn heads at any cubicle farm. I was going to make other calculator collectors salivate over my unique find. I needed this after learning that a fellow collector owns a Curta. Proof that I talked to a person. Needless to say, I was devastated. But I also saw an opportunity to attempt my first retrobright. The video attached to this review shows my process, and I'm trying to get more views, so if you're interested in seeing how that went, check it out. To quickly summarize, it didn't work at all. The Canon P101-D is a fantastic desktop calculator regardless. It's quite large but doesn't feel like it's wasting space. The numeral and operation buttons all press like mechanical keys with instantaneous responses. The exception is the "paper feed" button, but not at all in a bad way. It has its own sort of deliberate feel when pressed. Very sturdy and reliable internal components. When using the printer, every calculation is loud and mechanical, and it's awesome. It feels like a large cash register when this thing really gets going. It's hard to explain, but while loud and mechanical might seem annoying, it feels more like a reminder that this device will probably continue working forever. And of course all of this leads up to the absolutely gorgeous green LED display. Even with a cracked display cover (my fault), numbers have never looked better. This is simply a beautiful, solid calculator that I will proudly keep on display. I'm tempted to leave it in the sun for a bit to even out the discoloration, but there's a possibility I'll be revisiting this device in the future with another retrobrighting attempt. I have contacted Canon customer support to try to find the release year for this model, but they were unable to provide me with an answer. I've searched around for the answer and have found nothing so far. If you have any information about the release year, please let me know so that I can update this review. Cracked screen (my fault). Still looks great though. The bottom of the calculator, if you're into that sort of thing. Bottom of internal components. Excellent materials all around. Inside view with keys removed. Every key is made of a nice thick plastic. View of the LED screen without protective (and broken) cover.